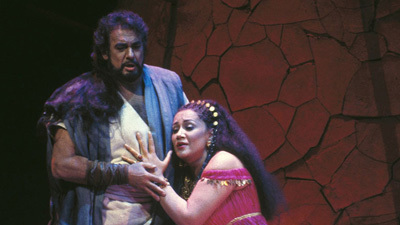 Plácido Domingo (Samson) and Denyce Graves (Dalila) give a searing demonstration of “onstage chemistry.” Certainly no one could possibly doubt that this Samson and Dalila were fated to be together, regardless of all the obstacles put in their way. Graves’s sultry, come-hither voice perfectly complements Domingo’s honeyed tenor. With Sergei Leiferkus’s authoritative High Priest.